" Thanks for this great website where Christians world wide can find movies that speak the Christian message. God Bless you." Not since the perennial keepsake albums by The Carpenters have we been given such intricate family harmony, layered with breathtaking orchestrations, all wrapped up in a warm collection of Christmas favorites. 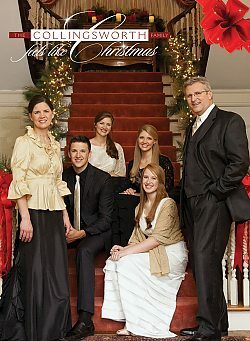 "Feels Like Christmas" by The Collingworth Family fills that special place under the Christmas tree with beautiful new recordings of more than 13 classic carols, memorable songs and fresh medleys to bring the true meaning of Christmas to each name on your Christmas list this year. This multi-talented family offers a sparkling variety of vocal and instrumental combinations to enjoy early and often during the season. The must-have program was recorded live in front of a sold-out crowd in Cincinnati, Ohio, and promises to be the perfect accompaniment to any gathering of family and friends to celebrate the birth of Christ. "Feels Like Christmas" will introduce The Collingsworth Family to a new generation of music lovers who crave timeless music, and these unforgettable recordings will hold a treasured place on the Christmas playlist for years to come.